Contractors and residential homeowners have come to associate the ECHO brand with the best outdoor power tools. With half a century’s experience in innovative designs like the hand-held crop duster, this company showcases a story of resilience and commitment. ECHO has its roots in Japan but now has a foundation in the most powerful economies in the world. It is a name to reckon with as many users love the consistency in every product that this company brings forth. So, why do we love ECHO as a brand and not any other? Well, when a company commits to deliver to the demands of the user, we are careful to watch that space. And ECHO doesn’t disappoint. They delve into optimizing performance, durability and most of all the ergonomics of every power equipment. Everyone who gets to use their tools agrees that they are efficient in every dimension. Among their line of products, there’s special equipment which has notable specifications. 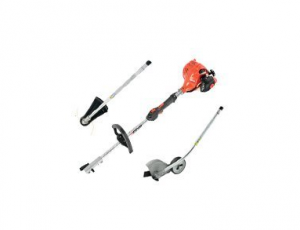 Their string trimmer indicates resilience, from the durable construction and that it embraces cutting edge technology. These string trimmers perform with excellence, start easy with the i-30 ignition system plus they are tolerant to the outdoor elements. They have the power to work from medium-sized properties to commercial estates. And, not forgetting if you have a small lawn you can opt for the very subtle cordless string trimmer. As much as they use gas engines, you’ll notice that they have the least emissions. They also boast small weight for easy handling. They are the remedy for a job well done when you think of the simplicity and integrated systems to make life easier. Better still, you can trust that they will last a long time, if not for the make; you can count on the guarantee that accompanies each product including these string trimmers. We have identified the best picks of ECHO string trimmers. With this list, you can make the informed decision you need for your lawn trimming needs. Third generation engineering is what you get with the SRM-280T. This string trimmer is more tolerant to high power hence the parts can run for longer without heating up and breaking down. This unit is a force to reckon with when you are looking to trim vast lawns. It starts smooth with just a little vibration and settles down nicely so that you can perform with ultimate proficiency. Echo excels in making only those products easy to the user. This is no exception with the speed-feed speed which allows you to reload the trimmer without disassembling the whole unit. In fact, it boasts reloading can take as little as under one minute. And when it comes to feeding the string, you’ll just be required to tap on the head, and the line reloads with ease. The rugged head construction gives it the capacity to handle medium-sized yards to covering extensive areas. With a 2-stroke engine, this unit manages to outdo tools with even higher engine power. It generates 28.1cc power to tackle hard tasks like thick grass. The power can spin at lightning speed to deliver even cuts such that you’ll need one pass each time you need to trim patches. This way, you gain a level lawn with no stress. Even better, you can manage the speed using the trigger. It lets you control the acceleration so that you can get to different types of weed. The SRM-280T comes complete with Echo’s 95 cross-fire line. But it does not stop there. You can also use 105line spool which gives you the flexibility of cutting tall weed without wearing the engine parts. There’s also the allowance of including some available accessories like bump heads which make it possible to work with a series of spools up to 155line. We like its simplicity that comes with premium qualities. Seasoned landscapers and the novice can use it with no hassle. The essence of a good string trimmer is for it to perform the best just the way you like. So when you find one that is flexible to take more than one attachment, then it’s definitely worth considering. Each attachment is easy to install; from the trimmer to the edger and even the blower. It comes with a quick change coupler to make the transition between tools painless. This versatility and convenience are available at a desirable price since it is cheaper than buying any of them separately. When you have the ability to switch tools, you’ll want to work with adaptor handles which do not break or snap at the first installation. The PAC Combo pack comes with all heavy duty cable shafts. These rods allow you to carry out large jobs with confidence that your tool is going to complete the task in a clean fashion. It comes with vibration reducing parts to achieve comfortable trimming. It also gives you total control so that you can maneuver your garden with much ease. With the open-faced metal shield, you’ll work safely against shredded grass from running back on your face. You’ll also love that it is rust and corrosion resistant; thus it will last a very long time. The trimmer comes with the Speed-Feed 400cutting head. It provides quick reloading and a simplified string feed system. The engine has a 21.2cc displacement. It can cut through the thickest of grass in fast, clean passes. This way, you are saved from repeat jobs and spending more time than you’d like in some parts of the garden. It explores the pro-fire electric ignition system. This method uses a spark system which makes it easy for the engine to warm up in quick succession. You’ll see it roar to life in seconds after pushing the start button. Again, we said about the unit accommodating many attachments. 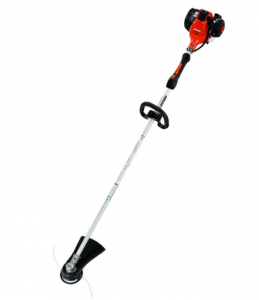 The Edger deserves special mention since it is a significant entity of a string trimmer. The Edger on this tool comes with a single wheel which lets you trim along hard floors and pavements. And, since it comes with a straight shaft, all you have to do is hold it in a vertical position, and the work is done in a professional style. In a nutshell, this is an all-around tool where you can find just about any necessary attachment to add to it. If you don’t mind spending hours on your lawn, this is the perfect unit for going from one tool to the next until you achieve the look you want on your landscape. When you have just small tasks to handle, you don’t need investing in a powerful string trimmer. The Echo CST-58V4AH can do the work just fine. This battery powered trimmer can make perfect small to medium-sized lawns. With a lightweight construction so you can work for long hours without hand strain. You’ll also love that it enjoys a long runtime, unlike some regular cordless trimmers. 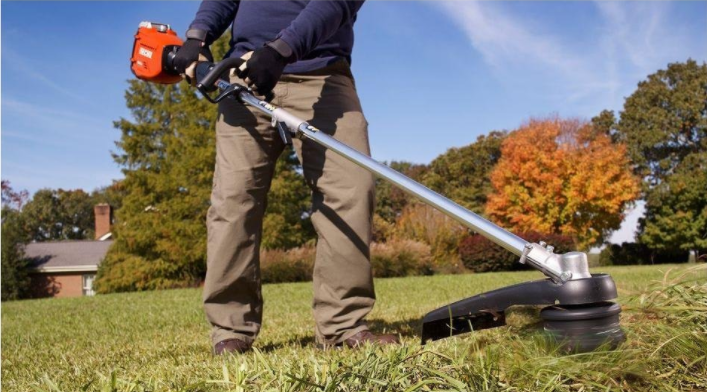 With a variable speed trigger, this trimmer can handle every grass you throw at it. It can even achieve very clean cuts thanks to the high power. It is pleasing to find that with the variable speed trigger; you’ll be able to increase the runtime hence you can cover a large area on one charge. Although we don’t always welcome a bump feed system, we appreciate that the CST-58V4AH enjoys a sleek feed which takes a slight tap to advance the string. 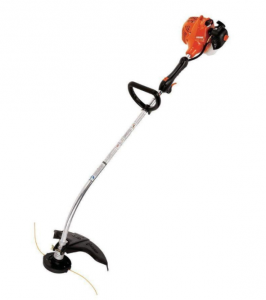 This string trimmer boasts the classic Echo-Speed 400 exclusive reloading mechanism. The dual line bump feed gives it a smooth method for reloading the feeder; hence it is free from messed up reinstallations which can be tougher than it appears. It also can vary the cutting swath between 14 and 16inches. This means you’ll not always exhaust the string after the first few cuts since you get to customize the way you cut. The Echo CST-58V4AH uses a brushless motor. This type of engine uses few parts which lead to even fewer fractioning parts. This process reduces the wear and tear that you could experience with brushed motors. It also benefits from a gentle start system with a push of a button. You’ll love working with a carbon-free tool. Because of the cordless design, it does not need fuel and oil mixing or rather wiping of carbon deposits. It is virtually maintenance free. The Echo CST-58V4AH also proves itself in terms of power and performance. You can vary the speed and the cutting swath. However, we have a setback with the runtime, and we hope ECHO could have made some improvements on the same. Grooming your lawn just got better with the ECHO SRM-225. It packs lots of energy at just 21.2cc engine displacement. If you are down to getting a sparkly compound, then you have this string trimmer for the taking. 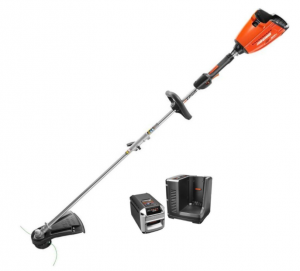 It is lightweight to work with for extended hours, exudes high power, and it carries a straight shaft to help get under shrubs and flowerbeds. You get to work with 17inches of a swath. This makes for clearing large areas in a short time accompanied with the large fuel capacity. This means you don’t have to schedule hours of getting your garden together when you can get there in record time. It eliminates the hassle of a limited runtime with a battery powered trimmer. You won’t even be fighting with power cords trying to get to all the overgrowth. It calls for some patience when working with a gas engine but we must say this trimmer is a catch. Using i-30 start system, you will be able to launch the motor with the first pull at the very least. With a 2-cycle engine, we always urge that you use fresh fuel to minimize on the carbon emission. Nevertheless, this unit beats most gas trimmers hands down. Better still when it comes to the feeder, it uses an automatic speed feeder which reloads in seconds. The SRM-225 carries excellent ergonomics including a long shaft to prevent working on a hunched back. You’ll also love the rubber molded grip which uses anti-vibration technology. This way, you are protected from developing complications related to a vibrating hand after years of use. Not forgetting that it comes with a grass shield to keep grass from blowing back to your face. All in all, this is a reliable model for those who want to complete big tasks in just a short time. It can make clean cut thanks to the vertical shaft and high spinning speed. It is ideal for small to average sized yards for a cleaner yard with the least effort. If you own a commercial estate, you how much a well-catered landscape means to you. The Echo GT-225 excels in high power and wide cutting swath to get your property into that fascinating look we love. We always expect that a gas-powered tool will weigh you down and delay your progress but the GT-225comes with only 10pounds. Considering you are looking at covering a few acres. This tool is a total steal. 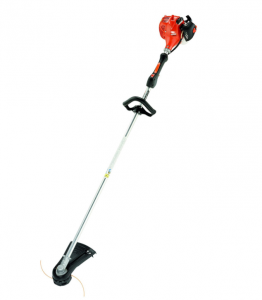 This string trimmer can comfortably generate 21.2cc power. It’s what you’ll ever need when you are down to thick grass and tough weed. The 48inch curved shaft lets you navigate around with ease as you can easily get in flowerbeds and gardens. And, as much as it is lightweight, it can take a few bumps since it has a sturdy construction. The head and shaft are nearly seamlessly intertwined to provide excellent strength amidst rugged grounds. Thei-30 start system allows this unit to start fast and easy. No one likes tagging at cords, and that’s where Echo comes through. You’ll be able to launch the unit with the least effort and use it with agility. It features a rapid loader system where you’ll not be fumbling with parts to input a new spool. Even better you’ll not be bumping the head to advance the string. It has the two-line Loader which lets you tap it when you have exhausted the previous line for continues working. It saves you from stopping midway so that you can be done and continue with other cleaning tasks. What’s more, it can cut up to 16inches wide. This width saves you time while allowing you to make quick passes and before you know it, you are looking at the best-trimmed edges. The GT-225 does not fall short when it comes to tending to you the user. It carries an adjustable shaft such that you can use it at the correct height thereby saving you from a painful back. You’ll also love that it comes with the speed throttle and a rubber handle. You’ll be able to achieve total control as with the cable flex the unit can come down to your working height or even extend it when you need a long shaft. This tool is worth considering for everyone who values a well-manicured lawn. It has high-performance qualities which brand as a better match for vast compounds. It has anti-vibration handles to enable you to work for longer. If you value a well-manicured lawn, you’ll want to consider the string trimmers on this list. They not only allow you to trim faster, but they are designed to call for the smallest upkeep. You’ll be able to use them in good condition for the longest time possible. ECHO does not disappoint when it comes to structuring equipment for every need. These tools are all very friendly with simple operations, adjustable handles and very minimal vibration. As much as most of them do not come with accessories, you’ll appreciate the power they use. They can trim wide areas by achieving fuel economy which helps the tool become fuel efficient. This aspect also makes them perfect for leaving clean and inviting lawns. In your quest for the next string trimmer, we hope you’ll find it easy and pick one from the tools we have listed. Have you worked with any of the string trimmers above? If so, please share with us some additional insights.